Ever since I got on my six am flight back to America, I’ve missed Florence. The feeling of living in a city with so much history and culture is just absolutely unmatched. I find myself reminiscing frequently, going through my Snapchat memories and the hundreds of pictures on my phone, trying to keep the memory of Italy alive in me. Needless to say, the three and a half months I spent studying abroad was absolutely incredible. I definitely had some ups and downs through the whole experience, but learned more about myself in those fifteen weeks than I ever thought possible. 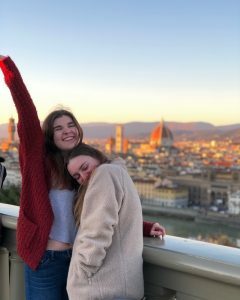 Here are the top five things that I learned about myself and the world around me, while studying abroad in Florence, Italy. 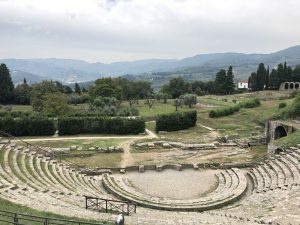 Field trip I took in my Art Walks class to the archaeological site in Fiesole! 1. Before being in Italy, I have never been a big museum gal. I get bored and end up just wandering around, looking at nothing in particular. While I was in Florence, I realized it was inevitable that I would spend some time in the museums. It’s kind of a must-do. After visiting various museums, I really learned how to appreciate culture and the arts. I was suddenly captivated by the ancient art and wanted to learn more about the artist and the pieces themselves. This is one thing that I’m really glad that I learned, because I think knowing about and embracing other cultures is key in being able to truly adjust to a new environment. 2. 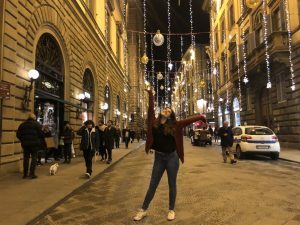 While abroad, I’m was kind of forced into interactions with other people, both the Italians and students in my program that are very different than myself. I had to learn how to get along with people who were MUCH different than myself. This was difficult at first, especially in regard to my roommates. Considering I had to live with these people, it was really important to me to have good relations with them, regardless of our immense differences. I became quick best friends with one of my roommates, Meghan, but my other three, not so much. I’m from the South, so the one thing that was forced on me pretty heavily was manners and making sure I am being considerate to others. I really learned that some people’s momma’s just didn’t teach them this, and I can’t expect everyone to have the same standards as me. Getting adjusted to interacting with other people was crucial with the locals as well. Despite our cultural differences, I had to learn to adapt to the Italian culture enough to fit in when I needed to interact with local Florentines. 3. Obviously, before coming to Florence, I really wanted to make sure I had some knowledge about the culture. 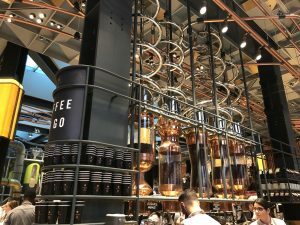 I’m a big coffee drinker, so I was quite excited to for the Italian café experience. I could just see myself sitting in a little family-owned café, sipping a cappuccino, eating a croissant, and being surrounded by the beauty that is the Italian language. What I did not quite expect was that the internet was serious about how difficult it is to get an iced drink. It took me three weeks to even find somewhere that I could get an iced latté (shoutout to Arnold’s Coffee). I learned that I am simply not sophisticated enough to stand at a bar and drink a cappuccino on my way to class. I prefer my coffee iced and in a plastic cup to go. The few cappuccinos I had were phenomenal and I know I’ll never find one that compares back home, but I’ll stick to my venti iced coffee from Starbucks. I guess that’s just the American in me. 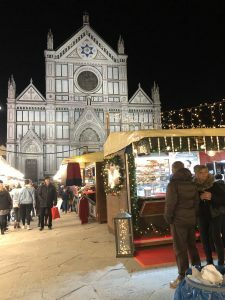 The Christmas market in Santa Croce, where much of my saved up money went. 4. The summer before going abroad, I worked forty hours a week, saving every penny up so that I would be able to enjoy my study abroad experience. I had earned this trip. Now, I have always been responsible with my money, but this amplified it. Especially after spending so much time saving and saving and saving, I really was careful with how I spent my money. Unlike some people, I lived on a budget. I didn’t just have my parent’s money and credit card with an endless limit. I chose to grocery shop and cook a lot of my own food, instead of going out for every meal. When traveling, I always went with the cheapest flight and accommodation options and made sure to not accrue extra charges. I didn’t spend my money on frivolous souvenirs that would end up in a drawer, never to be seen again. While this may have limited me at times from going all out, I’m thankful this is something I chose to do, because I have been able to continue with this financial responsibility back home as well. 5. The main thing I have learned about myself through studying abroad is how to be independent. Before, I was very much the person that always had to be surrounded by people. If I was going out and running the most boring of errands, I would always get one of my friends to go with me. I called my mom for absolutely everything, to know how to properly cook chicken breast, to make sure I was washing my clothes the right way, to give her a rundown of my symptoms and make sure that I wasn’t dying. Being four thousand miles from everything and everyone I had ever known taught me to trust myself and just go for it. In Florence, I’d go get coffee by myself, walk to class by myself, get groceries by myself. Because of the time difference, calling my mom was not always an option to double check that I was cooking my dinner correctly. During my stay abroad, I gained a newfound confidence in myself that came as a result of being independent. I really got to know and trust myself, and no longer doubt my ability to do things on my own. I never thought I would be able to make it all the way from Charlotte, North Carolina to Florence, Italy by myself, but I certainly accomplished that and I know that I am very capable of accomplishing whatever I set my mind to, completely on my own. Elise was a fall 2018 SAI Florence student from Winthrop University.